Joanie's Trendy Quilts : I Confess I am a Serial Quilter! is hosting a "Go to Jail" linky party/giveaway. to walk through your house and find evidences of being one! Hands down! I would be convicted! Click on LilyPad Quilting and follow the rules! I thought I had retired for the evening and couldn't resist joining the fun! Went and retrieved my camera and walked through the house taking snapshots. Honestly I have never thought about all the quilts that adorned my home. Not included are the quilted tote bags hanging on the door knobs. You can not have too many quilts! It's just a quilter's life! Hope to see you at LilyPad's! Joanie, I knew you were guilty.....LOL! 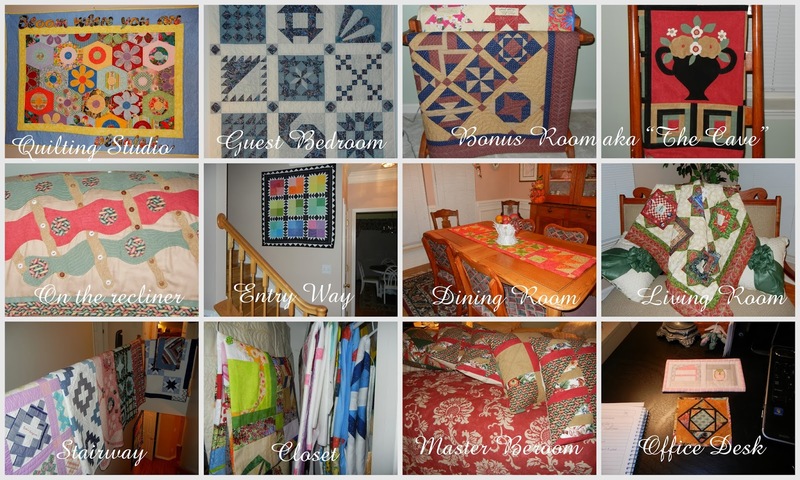 Great projects and quilts and isn't it fun to share all of them! Especially love the quilt in your studio. I can't wait until the day I can be guilty. So far I've just made quilts for all my family. And the goal was two quilts on the guestroom beds this year. One down and one to go. That quilt on your stairways is beautiful, although I did like them all! Plenty of evidence there to convict you. What a lovely collection of quilts. Great opening!! Fantastic collection of quilts. You are definitely guilty. Great quilts. Your quilts are gorgeous. I say we are all going to have to get together to bail you out my dear. Yes, you have enough evidence to convict! Love your quilts! Oh, yes! You are definitely convicted!! ;D I love the flower vase quilt. Well, when you said your quilts were all on display... you were not kidding! Yup, you're a quilter! And an awesome one at that! Guilty as charged, you are definitely a quilter.